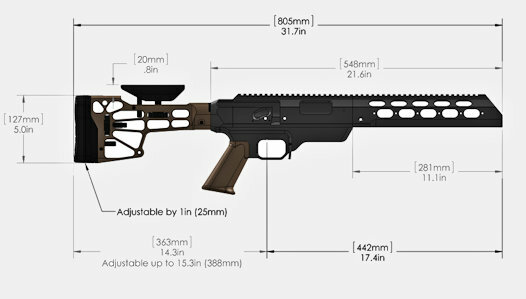 MDT's TAC21 Chassis is a modular weapon system that is easily adaptable to different missions and shooting styles. MDT tactical chassis series is a combination of benchrest accuracy, superior ergonomics and specialized design. MDT TAC21 is milled from a single billet of aluminum, and is hard anodized Mil-spec type III and Cerakote™ coated for a beautiful and durable matte finish. MDT revolutionary TAC21 Chassis takes full advantage of modern engineering, design, and manufacturing technologies, resulting in a level of precision that nears perfection. MDT TAC21 V-block mounting system provides the most accurate mounting platform for Remington 700 SA and LA actions. The TAC21 chassis is engineered to minimize warping and distortion. The rifle receiver only makes contact with the TAC21 chassis on the V shape bedding and recoil lug area ensuring the best accuracy and repeatability. The generous clearance on the fore-end makes OEM Standard and Bull barrel free floating (diameter up to the receiver size – 1.350”). Inherently the TAC21™ has a straight-line design, meaning that the recoil comes straight back instead of making the front of the rifle rise upwards. This results in more accurate and quicker follow up shots. In addition, this also translates to a decrease in felt recoil and comfort. The MDT TAC21 chassis has an integrated full length Picatinny rail (MIL-STN-1913) in 20 MOA (Minutes of Angle) on top of action housing and forearm. The chassis also supports installation of bolt on Picatinny rail (MIL-STN-1913) accessory mounting rails on the fore-end and side of the action housing. Mounting holes are spaced for Magpul style L5 (11 slots) and L3 (7 slots) rails (1.600” / 3.200”). The MDT TAC21 chassis for Remington 700 supports Short Action AICS style magazine in .223 and .308 caliber and Long Action AICS style magazine (3.715" length) in 300WM, .338LM, 7mm, 30.06. Note: Long action magazines come in 3 different lengths: 3.715", 3.775" an 8.050". MDT chassis use 3.715 magazines. If you purchased the Remington 700 Tactical Chassis Rifle, the magazine well is 3.775. Chassis made in Canada by MDT CORP.